On March 28, 1909 the South-Western Cemetery officially opened. Given its size and the vast park/forest-like layout, the South-Western Cemetery developed into one of the largest and best known burial sites in Germany already a few decades later. Several personalities found their final resting place here, such as, among others, Heinrich Zille, Rudolf Breitscheid, Lovis Corinth, Edmund Rumpler, Louis Ullstein, and the Siemens family. The overall impression is definitely influenced by the combination of garden and cemetery art, architecture and sculptures. Architects and artists such as Franz Seeck, Alfred Grenander, Max Taut, Hugo Lederer, Hermann Hosaeus and Emil Cauer worked here, to mention but a few. Apart from 19th and 20th century tombstone art, the mourning chapel in the style of the Norwegian Stave churches is the core of the South-Western Cemetery. Gustav Werner, royal building surveyor, found his inspiration in Scandinavia and between 1908 and 1911 implemented the chapel building plans. 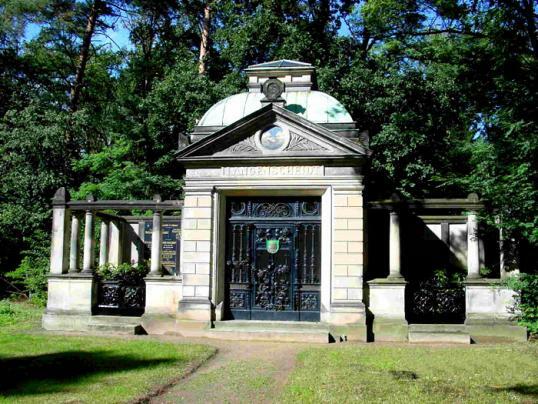 The cemetery achieved thus fame and popularity as a cultural monument, far beyond the boundaries of Berlin. We offer guiding tours to the famous dead people for visitors. Who would spontaneously like to come, can borrow a digital modern Audio Guide in the info house with German and English language. On the weekends classical concerts take place in the Norwegian wooden church. Oglejte si The Stahnsdorf South-Western Cemetery (Stahnsdorf, Germany) na večjem zemljevidu. Europa-Center Budapester Strasse Daily opening 10 a.m. to 7 p.m.
Brandenburger Tor Daily opening 10 a.m. to 6 p.m.
Fernsehturm Daily opening 10 a.m. to 7 p.m.
Brandenburger Tor Alexanderplatz Daily opening 10 a.m. to 6 p.m.